Start with a bright colour. Cinnabar greenish yellow, pink madder, all the cadmiums….This time it’s cobalt blue. Then zinc white (let it dry for a few days. There’s a build up of several layers, over days, each layer almost drying, but not quite). Take the rest of the day out, meet up with Clem Crosby to take another look at his show up at Pippy Houldsworth, then go on to see the Raoul de Keyser show at David Zwirner. I’d seen both the previous week, but both at the openings, too full, and frustrating in terms of seeing the work properly. But both clearly great cornerstones for me, reminders of just how particular, and how good in the right hands, paint can still be as a medium. Clem and I evoke the push and pull between an abstract language of the brush-mark, that point of balance between line and evocative form. Home, reading, David Bohm, ‘On creativity’, with an introduction by Leroy Little Bear, highlighting the similarities between Bohm’s theories and Blackfoot ways of thinking, energy waves or spirit, and the creative impulse and act. Then season three of House of Cards, and bed. I listen to BBC radio 2 or radio 6. in the studio. I haven’t been back in England long, and it’s a strange re-connecting with a past. Songs from my youth, that rise like long-forgotten bubbles. How much they kick into what I’m doing I don’t know. Some stories do – a child called in recently and said she’d kissed a frog, and caught salmonella. But it’s deliberately low-brow. Background noise, to break the tension, rather than intellectual fodder. When it irritates, which it inevitably does at some point, I turn it down low. Titanium white mixed with a small dose of Pink Madder (Quinacridone). The cobalt underpainting means that the whole has become a pale but vibrant lavender. One of the things I love about working in oil paint is the way in which the pigment below remains sensitive. The stretcher is from Russell and Chapple. 180x120cm. About as large as my reach can go, with the short-handled brushes I’m currently using. The canvas is 12oz cotton duck, primed. Now completely covered. 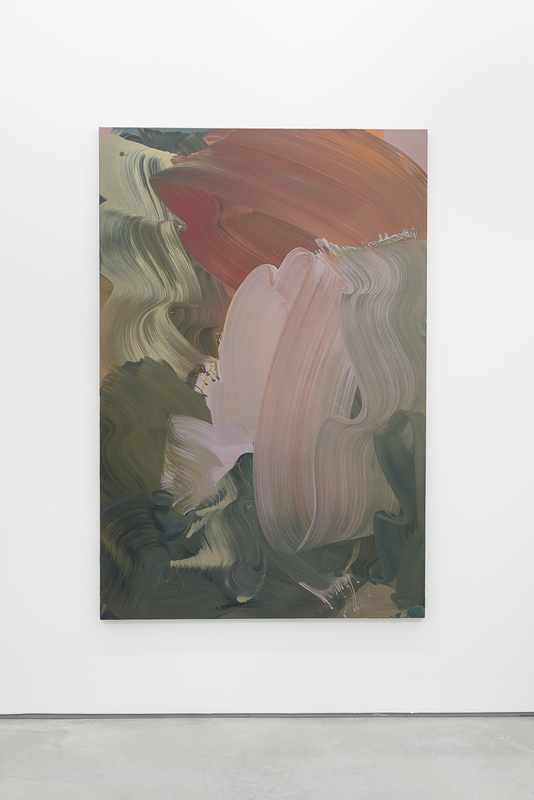 The paint has dripped and covered all sides, and will continue to do so – bearing witness to the successive layers. Working horizontal, on the ground, on thick cotton drop-sheets from France, heavy and absorbent. Thankfully, or it’d be a skating rink in no time. I have a box of Oblique Strategies in the studio, the old Brian Eno/Peter Schmidt set of cards. A ritual of sorts. Fortune cookies for creatives. The messages on some are as mundane as ‘Tidy up’; or ‘Simply a matter of work’, others ’Use an unacceptable colour’ or ‘ask your body’, are perhaps more provocative. One says ‘Slow preparation, fast execution’ – which is how I work when it comes to it. The work ‘proper’ is usually too fast for there to be a real intervention of a specific life other. Above all an attentiveness to what is happening with the paint. the movement, the colour. David Bohm ‘Wholeness and the implicate Order’ – that notion of wholeness, working wet on wet as I do, is essential to me. A painting can only function in and as a whole, both technically and even philosophically. Per Kirkeby’s ‘Manuel’, a collection of his writings, on geology, painting, sculpture, architecture. Gaston Bachelard, ‘Water and Dreams’ (L’eau et les rêves). An old catalogue – ‘Outside the Cartouche’ Gunter Umberg and Joseph Marioni, with Umberg’s introduction, subtitled The question of the viewer in radical painting’ – that’s a notion that’s important to me. There are lines that stay in my mind constantly from both; Eliot: ‘an infinitely tender, infinitely suffering thing’, High’s Crow, ‘flying the black flag of himself. Plath, Larkin…Poets who are very visually evocative, I suppose. The rain on the skylights today, is a hypnotic rhythm. I turn the radio down and go with that instead. Cadmium orange with a large wall-papering brush, the paint in a mason’s tub, thinned with a little solvent – blocking in summarily a large part of the surface. Lamp Black, in a vague armature, as close as I come to drawing, lines and loops, with a two-inch brush, thick-bristled. A larger brush again, and cobalt blue; this time untempered by white, strident against both lilac and orange. Yellow ochre, mixed with white, then a touch of raw umber, pulled over the blue with a thicker brush again. The harsh bristle leaves it’s trace, pulling up the cobalt below. I feel tempted by the pale fleshy pink, the tub of Zinc White and Pink Madder; obliterate much of what is there. It’s very binary, and almost figurative, the loops of ochre and lamp black like ears. I have learned to smile at these apparitions along the way – they are even tempting at times. But not what I’m after. I like knowing they are there underneath though. I mix some cadmium red (Michael Harding, good heavy pigment) with a touch of burnt umber, and obliterate again. It loses anything properly figurative. More yellow ochre. Then a strong cadmium yellow bottom left to counterbalance the red. A doubly curved sweep of black at the base to anchor things. The planes become more complex, spatially, the interaction and density are coming together. But it’s a little too tame. More cobalt blue into the pale pink, a vibrant lilac, and pull it across the pinks, dragging the cadmium red downwards with the mark. Step back. Stop. Take a break. (Cigarette, under the rain in the courtyard). Coming back, it’s too decorative, and overly calm. It needs upsetting. Always a moment that’s hard. A murder of sorts. Maybe for the better. But might just be lost. Murky greens cover the yellow, a permanent green light, mixed up with some raw umber. A tub of white, with a touch of cadmium creates a vibrant beige. Instinctive, and fast, over top left. I like what it does, but am losing my cadmium red, re-work that up to a glow. Then the lilac again. There’s something on the edge of the biomorphic that begins to happen, with the paint, and the forms. Anything clearly figurative is long gone, but there are shapes that are alive. I find memories of childhood readings, and images above all, sneak in more and more – Dr. Seuss characters; the figurative that isn’t, exactly. The universe of Maurice Sendak, ‘Where the Wild Things Are’. What’s glimpsed through the layers. Cheekier elements, too, of cartoons; Lady Penelope, that a particular pink evokes for me. Edward Gorey has always been there, under the surface. Anthropomorphic, or biomorphic, but far from human. Universal in any case. Another break. It’s dark out. I’m getting tired; and cold. I’ve been painting for eight hours. I feel something is very close though, which is exhilarating. At this stage it’s almost a tight-rope walk. Cobalt blue, burnt umber, mixed together summarily. Solvent. A thinner brush. Attacking, with a cheekier line. Ocre and dirty white again. Time to stop. An hour of wandering around the studio, cohabiting with the work. I think it’s finished; at least it seems to have it’s own existence, and presence. There’s a wariness, an oblique observing. The confirmation will come in the following days or weeks. At home, I read an airport thriller, a Jack Reacher novel, by Lee Childs. Deliberately mindless, trying not to think – the paint tends to stay on the retina. It sometimes takes days, if not weeks, for me to have confirmation that a painting is finished. This time it is. This is a superb piece of writing, “…the paint tends to stay on the retina”, is a compelling observation.